Purchase tickets or view tours here. The Taliesin estate was his laboratory of organic architecture, with designs from nearly every decade of Wright’s life. The Taliesin residence is the heart of these buildings that Wright designed and modified from 1897 to 1959, including the Romeo & Juliet Windmill, Hillside School, Tan-y-Deri, Midway Barn, and the Frank Lloyd Wright Visitor Center. These are among the reasons Taliesin is often described as Frank Lloyd Wright’s autobiography in wood and stone. 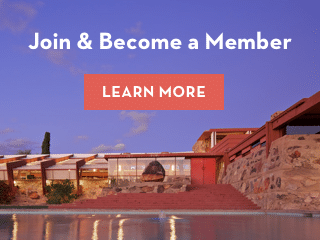 Taliesin Preservation since 1990 has served as steward of Taliesin in a collaborative agreement with its owner, the Frank Lloyd Wright Foundation. The dual mission of Taliesin Preservation is to preserve the cultural, built and natural environments that comprise the Taliesin property and to conduct public educational and cultural programming that provides a greater understanding of Frank Lloyd Wright’s architecture and ideas. Learn more about the public tours of Taliesin and the rich array of arts, cultural, and educational programs offered by Taliesin Preservation. For anyone who has ever wanted to take a road trip with Frank Lloyd Wright, the next best thing is now available as a one-of-a-kind experience of Wright’s tremendous impact on his home state of Wisconsin. In March 2016, Governor Scott Walker signed legislation and dedicated $50,000 to create the Frank Lloyd Wright Heritage Trail, a scenic tour spotlighting Wright’s buildings throughout the state. It covers Wright sites from Richland Center (Wright’s birthplace) to Racine (S.C. Johnson Research Tower and Wingspread).